Only two days and I completely fell in love with Banana House and Wellness Centre in Lamu area Kenya! Visiting Lamu is a total experience, but staying in a place like Banana House, makes the experience an unforgettable one! The beautiful decoration of the place, the seclusion of its rooms, the intimacy it projects, and the tranquility you can feel there allowed us to enjoy Lamu to the fullest. This place is so special. We felt so much welcome and more than good taken care of by Monica and her staff. It is built in attractive Swahili style, with open spaces and veranda's where you can launch and relax. 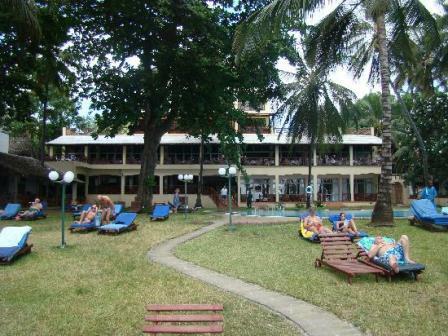 The whole atmosphere is tropical and quiet and provides many possibilities to relax and gain new energy. The spa treatments (foot reflexology! ), yoga classes and fantastic meals (Lamu's best food if you like healthy, tastefull meals prepared with lots of attention) contribute to well being. What makes it special is that everything is done with respect to local culture. The view (not from the beach but a little higher from a top) is amazing, with sunrising and sunset, dhows and the sea. It is really a beautiful never-to-forget experience to visit Banana House at Lamu! It is the kind of place that you surely want to visit again when leaving.